102 years ago today there was great excitement on the North West coast of England. Horse racing was about to begin in Blackpool. The site that was prepared was a large expanse of relatively flat ground, just the sort of terrain that racecourses, military camps and airfields all require. During the First World War it was not uncommon for racetracks to be taken over by the Army for use either as training camps, temporary barracks for soldiers on their way to or from the trenches, or as medical establishments. The Royal Flying Corps used some, again for training, or as dispatch fields from which the aircraft left for France and Belgium. Blackpool racecourse, or Clifton Park as it was officially known, is one of the few to have fulfilled all three purposes. 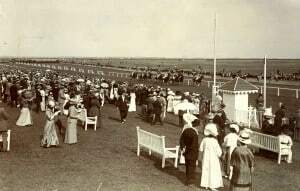 The first attempts to bring racing to the Fylde coast took place in 1865, but proved short lived. After a two day meeting in September that year, and again the following year in the grounds of Layton Hall, on the road out towards Poulton racing was abandoned. The revival started in 1910, with the announcement of plans to build a new racecourse on the Squires Gate airfield. This seemed odd to many people, as the previous year the airfield had hosted a very successful first Aviation Week, but by the time of the 1910 Flying Carnival, permission had been granted for the racecourse, and that put an end to flying there for many years. The publicity that was a precursor to racing at Clifton Park promised much, with the West Lancashire Gazette stating that “all preparations will be on a scale to compete with the highest class of steeplechase racing in France.” The four shareholders brought in the ground staff from Hurst Park to construct fences identical to those at the Surrey course, on a flat left handed oval course of about a mile and a half. It featured a 60ft wide steeplechase course and a 75ft wide hurdle track. It was dubbed “the English Autheil”. There were 144 stable boxes, and state of the art stands, made from steel and concrete, for 25,000 spectators. The enclosures were sloped to maximise viewing. Everything was set for the first of eight days racing, all scheduled for August and September, in an attempt to maximise Blackpool’s swollen population during the summer holidays. The first meeting opened on 1 August 1911, preceding the traditional opening of the jumps season on the Bank Holiday Monday at Newton Abbot and Hooton Park the following week. Newton Abbot still hosted the first jumps fixture right up until the introduction of summer racing. A crowd of 20,000 augured well, although the executive would have been disappointed that the anticipated participation of Lutteur III, the 1909 Grand National winner and Jerry M, runner up in the 1910 National, in the feature Coronation Gold Cup failed to materialise. Many people had travelled to the course by train, alighting at Squires Gate station, still in use, though much changed. A railway strike was under way at the time of the second meeting a fortnight later, and this was blamed for a substantial smaller crowd. It can’t, though, have contributed to the smaller fields, which left two races as walkovers and the two runners in the Lytham Chase refusing so many times that the race had to be declared void. The following year saw a change of plan, with racing scheduled for the traditional jumps season. That meant a break of just four months between September 1911 and the first meeting of 1912, which took place in January. This was dogged by small fields, as were the following ones in February, April and December, and so, barely a year after racing had begun, its demise was on the cards. 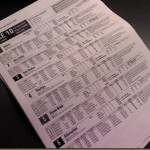 Matters were not helped when a committee of the Racecourse Company alleged that the management had wasted much of the money invested to bring the sport to Blackpool by offering unreasonably high prize money. In 1913 that was reduced considerably, whilst the pattern of small fields and walkovers continued. The writing was really on the wall the following year, when a court action was taken out against the racecourse and receivers appointed. They oversaw two meetings, but the advent of war meant those scheduled for September were cancelled. That might have signalled the end, but there were a further three days racing early in 1915. 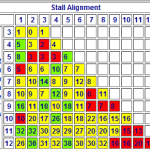 One day’s card attracted only 15 runners for the six races. The military soon requisitioned the site, and it was turned into a convalescent hospital, providing accommodation for 2,000 soldiers from the King’s Lancashire Military and a staff of 200, and racing at Clifton Park was over. After the war there were half hearted attempts to bring racing back there, and as late as 1965, when Aintree’s future was in serous doubt, a new site at Blackpool was touted as the saviour of the Grand National, but it came to nothing. By then, the racecourse had reverted to its former use as an airfield, and if you flew from there back in the 1950s, you would have been able to see the grandstand. Now you’ll likely park your car on the final turn, and then check in exactly where the grandstand used to be. But there’s nothing, not even a street name, to remind you of three years in which grand designs and ambition proved insufficient to maintain racing in Blackpool. Thanks Scott. I had to re-read your comment about four times before I spotted the blunder! Will rectify now. Good spot.